As retired teachers, Rick and I realize how an education changes lives. When he found “Pack for a Purpose”, donating items during our travels became so much easier and we knew we were giving the items needed. Istanbul, Turkey was filled with amazing people and breathtaking architecture. It was the cleanest city that we had ever visited. We dropped off our items at the Ritz- Carlton. The hotel helps sponsor two elementary schools that educate both boys and girls ages 6-12. The interest and concern by the staff for helping the schools impressed us. 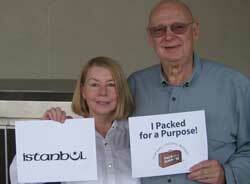 “Pack for a Purpose” is a brilliant and well organized program. It allows our travel to have both meaning and impact.